Valve has been forced to make an update to its SteamVR software and the maximum threshold for tracking that its Lighthouse sensors could operate at because some gamers playing the rhythm game Beat Saber were moving so fast that the sensors were losing track of them. 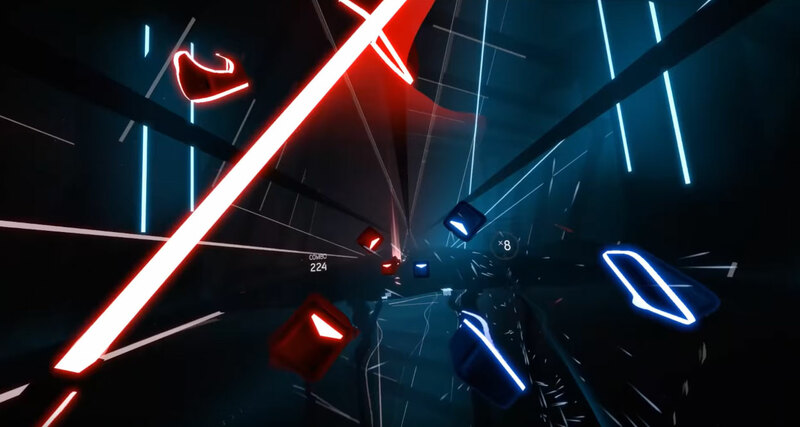 Beat Saber is a game a little like Audioshield, Guitar Hero, and Audiosurf, but instead of having you dodge the notes or block them with a shield, or hit a button at the right time, Beat Saber has you shredding each note in half using one of a pair of light sabres you hold in each hand. They have different colors and depending on the colors of the notes you have to cut differently or use a different sabre. It's a fast and frenetic game and has proved to be one of the most popular virtual reality experiences available for the past couple of years. But it turns out people are just too good at it. "Increase limits of what we thought was humanly possible for controller motion based on tracking data from Beat Saber experts," Valve's update notes for the latest release of Steam VR 1.3.2 reads. It turns out the fastest Beat Saber players were able to turn their wrists so quickly -- 3,600 degrees per second — that the sensors were losing track of their location for a fraction of a second because the Lighthouse trackers weren't refreshing often enough. Now that's been changed and the maximum threshold has been increased to keep a better eye on those rotating wrists. Are any of you serious Beat Saber players? Will this update help you perform that bit better?